For the first time, a drumlin - a mound of sediment and rock - has been observed mid-formation. The streamlined, elongated hills form underneath ice-sheets as they scrape up material as they move. While many relic drumlins are well known features in once ice-covered areas, this is the first time an active one has been observed. It was found under the ice in Antarctica, a team reported in the journal Geology. The scientists believe it will help shed light on ice-sheet behaviour. 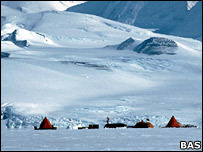 The Rutford Ice Stream, a 2km (1.2 mile) thick, fast flowing ice stream, which drains part of the West Antarctic ice sheet into the sea, creating huge floating ice shelves, was the location of the discovery. The team surveyed the area three times over a period of 13 years, between 1991 and 2004. "We went from this feature not being there, to suddenly, bam, this big mound had risen from the sea-bed. This was a really big surprise," explained Professor Tavi Murray, a glaciologist from Swansea University and one of the authors on the study. "People think of glaciated landscapes as representing thousands or tens of thousands of years of time; then suddenly here we have this thing that is the size of a large warehouse popping up in this very short period." The drumlin, which is still growing, now measures about 10m (33ft) high, 100m (330ft) wide and 1km (0.6 miles) long, and is growing 10 times faster than had been expected. The speed of its growth has altered the scientists' perceptions of past drumlin formation. "There are a quite a lot of these features around the world; you may have seen them in the Pennines or in the Yorkshire Dales. 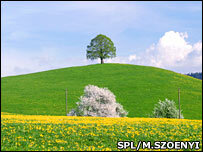 These were deposited during the last ice age and are relics in our landscape. "But instead of representing what the ice was doing over a really long time-scale formation, they are really brief snap-shots of what has happened in the past. "The bed underneath these ice streams must be changing really rapidly, much more rapidly than we thought before." The drumlin could also help glaciologists to understand how fast flowing ice streams respond to a changing climate and changes in sea level. "The ice streams in Antarctica control how much ice is stored in the ice sheet," explained Professor Murray. "If you can change the speed at which the ice is moving through them, then, basically, you have more or less ice kept in Antarctica - they are the volume regulators. "The results show us that the bed of a fast flowing ice stream can change rapidly. "So the response of the whole ice sheet to changes of sea level or climate could be faster, because the beds of these ice stream can be changed much faster than we have previously thought possible."